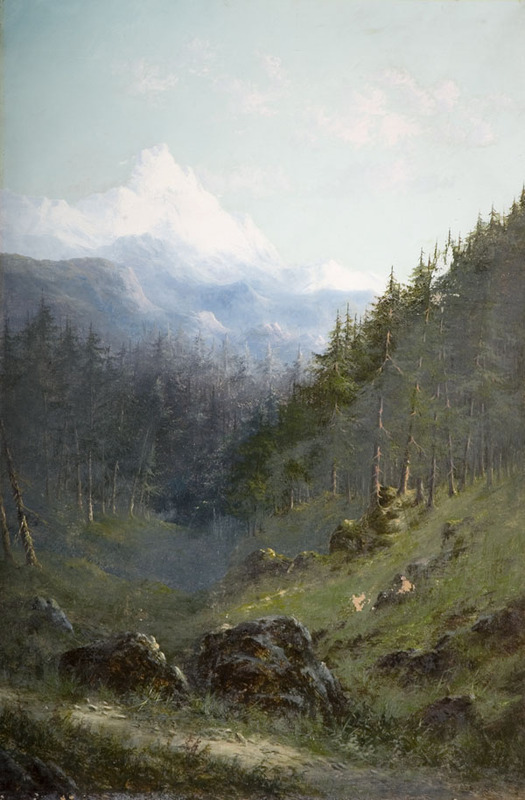 Summary: Oil painting showing an Alpine landscape. There is a green tree-lined valley and in the distance snow-capped peaks can be seen. Description: Samuel John Barnes was a British landscape painter. He was born in Birmingham where he studied at the Birmingham School of Art and later in London. Barnes' paintings of the Scottish Highlands, depicting highland cattle and red deer, were highly regarded by Queen Victoria. However, he also painted masterful European landscapes, like this one, as well. The Valley of Rhone lies between The Alps in France. Mountains are often used in painting to stand for the sublime, which are the powerful feelings we can have when looking at beautiful and magnificent landscapes. 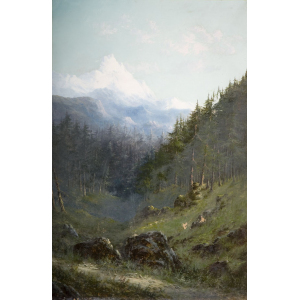 The middle of the painting is between the alpine trees and forms an inverted, or upside down triangle. Artists deliberately use this technique to draw us in, and to encourage our eyes to look upwards and outwards. In this work our gaze is finally directed to the pinnacle of the snow capped mountain.